So Heaven’s Bones, the Victorian Ravenloft tie-in I wrote a few years back that’s filled with clockwork angels, insane gynocologists and all manner of weird stuff, is available in audio and e-book – but since it went out of print hard copies are hard to come by and are offered for ridiculous prices from Amazon affiliates. But now you Ravenloft completests can get a hard copy (signed! and I may throw in something else!) with the Allegories of the Tarot STAR package, for $100 – only two left! And you get the anthology and e-books and profound thanks. With two days to go we are over 60% of the way there – help us go over! A few years ago my friend and workshopping-mate, Sheila Finch, mentioned my name to editor and author Deborah Ross, who invited me to submit a story to a follow-up of the Lace and Blade anthologies. People familiar with my work know I tend to get a little, well, weird, and more than a little dark, so I was thrilled to get a chance to try my hand and something a little more cheerful and swashbuckling – and therefore the clever Lilliam, affable-yet-shrewd Lukah, and perpetually clueless Kai were born. The anthology was published as The Feathered Edge, with stories by Sheila Finch, Sherwood Smith, Kari Sperring, Sean McMullen, Judith Tarr, Madeleine Robins, Shannon Page & Jay Lake, Tanith Lee, Dave Smeds, Rosemary Jarman, KD Wentworth, and Diana Paxson – a stunning line up, and now the Kindle edition is available for $4.99. Deborah has been profiling the stories and their authors on her blog (mine’s here), and it’s a fascinating account of what goes into an editor’s process when working on an anthology. “Maybe the Stars,” an Innsmouth-influenced story and an original at Drabblecast last year, is now online in the latest issue of the Lovecraft eZine. There was a strange passenger now, not in the cabins or the tiny cells, but in the hold, in the big reinforced cage deep inside Midnight’s Lady’s iron and steel bowels that was sometimes used when a man got drunk and nasty. Midnight’s Lady met a small vessel with one lone ghostlight burning at its prow. There was much low-voiced, urgent talking and scuffling on deck. She’d crouched beneath the lip of the captain’s cabin and listened, hearing at least three different languages and a muffled sound that might have been a dropped load, or a shot. The next morning when she dumped a night-bucket over the side she saw no other ship, but a thick oilslick on the water that flexed an infinity of rainbows this way and that. The problem with his thesis, of course, is that the scope of the poetry he examines is vanishingly small. The three magazines he cites by no means comprise the face of SF poetry, and it’s a bit odd that anyone claiming knowledge of the field would think so. I suspect from his response to some of the comments that Mr. Cook is not interested in having a conversation with anyone but the imaginary angry and defensive SF poets who “take themselves very seriously and would quail at the remarks I’ve just made” that live in his head. ** I’m not pointing at the post to boost the kerfluffle-factor, but to mention that in the comments that people have offered a lot of links to and examples of SF poetry venues, as well as discussion of the nature of SF poetry (Mike Allen, Mari Ness, and Marie Brennan*** are especially smart here) that might be of interest to people curious about the field who do not think that reading three non-poetry journals makes them an expert. *Many are bad! Some are mine! **I may be wrong! I hope so! At the Amazing Stories blog, Diane Severson Mori has posted a rather wonderful review of my poetry chapbook, The House of Forever, along with a most excellent reading of one of the poems from the book. Also, “Beside Calais” from Strange Horizons has made the Locus Magazine Recommended Reading List, along with some other short fiction that makes me happy to even be in the same room. This Friday, February 1, submissions will open for issue 6 of the short-form speculative poetry magazine, inkscrawl. I invite any and all to submit speculative (i.e. : having some fantastic, science fictional, or mythic flavor) poetry 10 lines and under. How epic can you get at 10 lines and under? I invite you to read NE Taylor’s 2-line poem “Sarcophagus” (which appears on at least two poetry editors’ recommended lists for 2012) and see. Guidelines are here, and submissions will be open through April 30. Rose Lemberg, editor of Stone Telling and owner of Stone Bird Press, has been collecting various speculative poetry editors’ recommendations of poetry published in 2012 (not poems they had edited, written or published). So far she’s posted the selection of Adrienne Odasso, Amal El-Mohtar, and Alexa Seidel, and today I weigh in with recs for poems by Alex Dally MacFarlane, Amanda Reck, Elizabeth McClellan, David Edwards, and Gwynne Garfinkle. 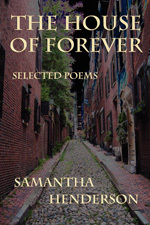 Sandra Lindow (an awesome poet herself) reviews The House of Forever at the Science Fiction Poetry Association’s website, saying: Rhysling-award-winning poet Samantha Henderson is comfortable with the incomplete, the hidden, the broken and the layered. That’s what makes her poems so compelling. Another publication from Raven Electrick Ink, the compilation anthology Spec-tacular, gets a great review here (with well deserved kudos for Jude-Marie Green’s retro “Hula Hoop”). My Forgotten Realms novel, Dawnbringer, is now available as an audiobook at Audible (read by Christina Thurmond), as well as my Ravenloft novel, Heaven’s Bones (read by Tavia Gilbert). The sample of Heaven’s Bones is especially shivery. I did know that Wizards of the Coast was planning a mass release of Forgotten Realms audiobooks this year, but it’s a nice surprise that they also released the Ravenloft books, especially since the Ravenloft novels (as far as I know) aren’t in print. By the way, I’m seeing that copies of Heaven’s Bones are available from $11 to $270 (?!) from dealers, and know someone who paid something like $30 – If you’d like a print copy, please let me know; I’d be happy to fix you up quite reasonably and sign it, even, with my own name if you insist. “Outlander,” published in The Feathered Edge anthology, and also podcast on Podcastle. “Beside Calais,” published at Strange Horizons, and also reprinted in Steampunk 3: Steampunk Revolutions. “Everything You Were Looking For,” published at Bourbon Penn and podcast at Podcastle. “Maybe the Stars,” a take on Lovecraft’s “Shadow over Innsmouth” commissioned by and podcast at Drabblecast. “Vesta Variations: Two Poems,” a collaboration with Kendall Evans, published at Astropoetica. “Reverse Burn,” another collaboration with Kendall Evans, published at Jabberwocky (which I am very sorry to hear will no longer be publishing).